Real has been funded by Trust for London to set up a disability hate crime project in Tower Hamlets. To raise awareness of disability hate crime in Tower Hamlets. To provide an assisted disability hate crime reporting service at Jack Dash House. 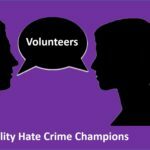 To recruit and train a team of volunteers to become disability hate crime champions. To create and deliver disability hate crime awareness training workshops. Real is looking to recruit a team of volunteers (ideally with lived experience of disability hate crime – but not essential) to help us deliver the aims of this project. If you are interested please contact Wendy Haslam by calling 020 7001 2177 or emailing disabilityhatecrime@real.org.uk. This project is one of three projects managed by Real’s Engagement and Communications Team. The team is managed by Engagement and Communications Coordinator Mark Healey, and includes three Engagement and Communications Workers. Dhwani Shah Project lead – Communities Driving Change Project. 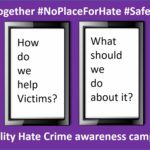 We are currently in the process of developing a disability hate crime awareness campaign which will focus around promoting a message of H.O.P.E. Operational responses to hate crime. Empowering communities affected by hate crime. 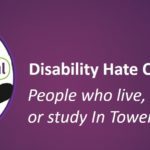 Three disability hate crime round table events in February, June and October. Disability hate crime workshops for disabled people, for front line staff and for members of the wider communities. Partnership events with Tower Hamlets Council, Tower Hamlets Police, key partners and communities affected by hate crime. Keep an eye on our events page here for details of events we are organising. We will use Real’s media and social media to promote our campaign, and we have set up project specific social media profiles too. Follow our @RealH8CProject Twitter profile here. Regular updates will be included in Real’s newsletter. You can also join Real’s Facebook page here and follow Real’s twitter here. We will create a range of resources to promote disability hate crime awareness. We have set up an assisted disability hate crime reporting service at Jack Dash House. What support will Real offer people who contact us? We will invite you to a meeting with one of our hate crime team so we can discuss what happened. We will listen to what you have to tell us. We will talk you through what you can do next. We will provide you with support to report to the police. We can also refer you to other organisations for further advice and support. 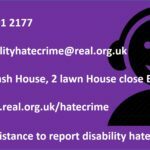 More Information about Real’s assisted disability hate crime reporting service is located here on our Get Support pages. Recruiting and training a team of volunteers to become disability hate crime champions. We have already recruited a couple of volunteers but want to recruit some more people to help deliver the project over the next few months. If you are interested in volunteering please contact Wendy Haslam by calling 020 7001 2177 or emailing disabilityhatecrime@real.org.uk. 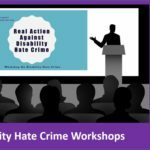 Creating and delivering disability hate crime training workshops. We have created, and are delivering disability hate crime awareness training workshops in Tower Hamlets. If you are interested in our workshops please contact Wendy Haslam by calling 020 7001 2177 or emailing disabilityhatecrime@real.org.uk.